When was the Virginia Glee Club founded? On the eve of the 140th anniversary of the Virginia Glee Club, whose founding date (1871) makes it one of the seven oldest collegiate glee clubs in the United States, it feels curmudgeonly to point out the relative lack of hard evidence for the 1871 founding of the Club, and the abundance of pointers to other prospective founding dates—1886? 1893? 1914? What about dates before 1871? Each has some degree of validity as a starting point for the messengers of harmony, love, and brotherhood. So, curmudgeonly as it feels, we should at least take a peek at the alternatives. 1886: In the early 20th century, the Glee Club looked back to this year as the year of its founding. Harry Rogers Pratt’s Glee Club counted 1935-1936 as their 50th anniversary year and celebrated it with a tour to New York as well as a 50th anniversary concert, held 75 years ago tomorrow. But no historical record remains to tell us what happened in 1886 save a single mention of a Glee Club tour in the Magazine, and that reference makes it sound as though the Club had been around for a while. 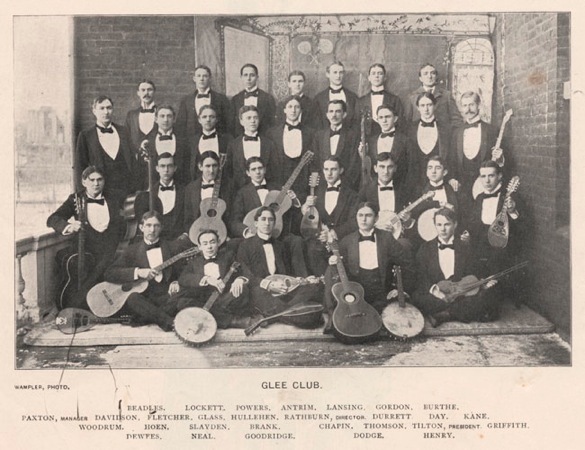 1893: The birth of the Glee Club (actually, the Glee, Mandolin, and Banjo Clubs) as a group that toured beyond the University precincts. Their six city tour in January-February 1894 resulted in press in the Atlanta Constitution among others. But there appears to be continuity between this group and its 1891-1892 predecessor, so while 1893-1894 was an important turning point for the Club it would be inappropriate to call it a founding date. 1914: After the Club disbanded in 1912-1913, it re-formed after a brief hiatus under A. L. Hall-Quest. This is one of the first few firm dates attested outside of the pages of College Topics, as it appears in Philip A. Bruce’s History of the University of Virginia. We can trace continuous activity of the Glee Club forward from this date, even through both World Wars; 1914 thus stands as a significant milestone in the life of the group. So 1914 is the latest date that we should think about in terms of the (re-)formation of the Glee Club. But is there an earlier date than 1871? Would you believe two? 1861. Cited in several places, including the Shadow’s on the Sundial liner notes and Barringer’s 1906 University of Virginia: Its History, this was apparently a serenading group that came out of the student housing on Carr’s Hill, just as the Cabell House Men were themselves a boardinghouse group. Traditionally we have considered the 1861 group a “predecessor” and not part of Glee Club history; separated not only by ten years but also by the Civil War from the “official” group, the Carr’s Hill Glee Club might as well have been a century before. So where, after all, does this leave us? Perhaps with this thought: If we are to accept the gaps in the Glee Club’s history after the 1871 date, should we not extend the founding date to 1870? Perhaps not all the way to 1861, but absent any other information, it seems as though the Club referenced in 1870 is the same as the one in 1871. Or, perhaps, we should leave well enough alone, and leave traditions where they stand, and accept that, when you are tracing the foundation of a group of students, one beginning point is as good as the next. All I know is that I’ve got a definite research agenda for when I head back to Charlottesville before the reunion. I’ve got to find that January 1871 Virginia University Magazine, and any other old records I can. Author Tim JarrettPosted on February 20, 2011 May 6, 2013 Categories Music, VirginiaTags virginiagleeclub4 Comments on When was the Virginia Glee Club founded? I don’t know why I’m surprised, or saddened, to see that the cyclotron where I cut my physics teeth as a high school student is involved in the creation of a “death ray.” But I am. Nice concise explanation and diagram for SAML. It seems like a very long time since I’ve sat down to write anything longer than a tweet or a bookmark. The usual reasons apply–family pressures, work getting crazy, etc.–but a big part of the reason is simply that I’ve been blocked. I’ve never been one to write a lot about the family. So that’s out. That leaves, of the former obsessions that have powered this blog, cooking–and my chance to do much of that has been constrained by the same factors that have taken my time to write away–and music. Well, then: music it is. As luck would have it, I actually have a reason to write about music. Next month is the 140th anniversary celebration of the Virginia Glee Club. (You are going, aren’t you?) So in preparation for the anniversary, I think now’s as good a time as any to start to synthesize all the historical research that I’ve been building up on the Virginia Glee Club history wiki, and pull out some of the more illuminating bits. It should be a good exercise in warming up, and I’ll try to do one or two a day. After that, who knows? Maybe I’ll have succeeded in unblocking myself. I’ve got to try somehow.